A guide for getting the SWTOR achievement Making the Connection under Location –> Makeb –> Citizens of Makeb. This achievement is worth 25 points and requires you do complete the various staged weeklies in a specific pattern. Complete all possible interconnections in the weekly mission Mass Exodus for the Citizens of Makeb. Note that you need to do the required missions for each sub-achievement within the same week. Credit to Daduhulk on the comment section. You can either do this with one character or with multiple characters to speed it up. Just have the other characters do run 2 or 3. Run #1 : Stage (1) Too Close to Home , Reverse Engineer, Into The Fire, do Reallocation (bonus) during interlude, then Signal Intelligence, Taking Back Talaos and Hostage Rescue. This run nets you 6 sub-achievements. Second run : Among the rubble and any other two Stage 1 missions, then Door to Door, Hostage Rescue and Stone and steel. This run nets you 2 sub-achievements. Last run is Operation Overwatch (bonus! ), H4 Vipers and H2 Counterstrike. Nets last two sub-achievements. Do [STAGE 1] Among the Rubble and then [STAGE 2] Stone and Steel. Do [STAGE 1] Too Close to Home –> [STAGE 1] Reverse Engineering –> [STAGE 1] Into the Fire. Do [STAGE 1] Too Close to Home and you will get this bonus objective during the interlude. Do [STAGE 1] Reverse Engineering to unlock [STAGE 2] Signal Intelligence. You will get a flare gun on [STAGE 2] Signal Intelligence. Then do [STAGE 2] Taking back Talaos and you will get a bonus objective when you pick the Binoculars during that mission to Secure the City. To get [STAGE 2] Signal Intelligence, you need to first complete [STAGE 1] Reverse Engineering. Thank you Dulfy. It was fun figuring out the connections. 🙂 Sad to know for sure that it is bugged. Who knows, maybe patch 2.1 will fix it tomorrow. But they should put it on the known issues list at least, along with the Makeb Loremaster achievement. Please note that the a.m. is Republic only. Imperials have different set of dailies and combination. I only see this one, where is the Imperial one? Indeed. Got the message from Jace but no update (after 2.1). I have not been able to get to the Brakan Mesa on either faction.. did I miss something along the way? 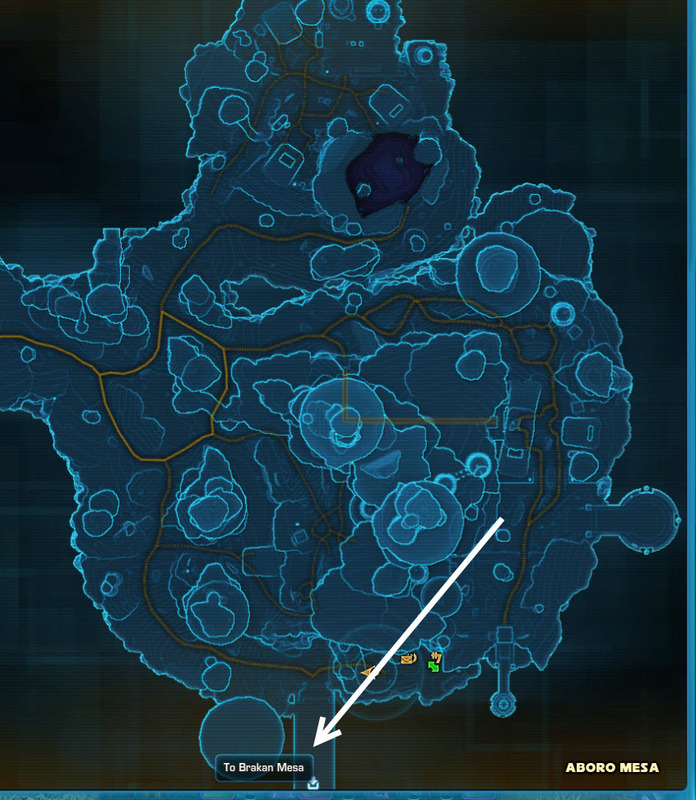 It is directly below Hutt Stronghold (on pub map). I can see where the area is but there is no speeder to get to it and no quick travel point there.. is the same on my imp map. I’ve completed the story lines on both sides and can’t figure out how to get there. Is the only thing I need for 100% map complete. Excuse me but you say go to stage 1 then to stage 2 then back to stage 1?! Can you go back and forth between stage 1 and 2?! This is not meant to be done within a single week. It may take several weeks for you to complete them all so plan accordingly knowing that once you pick 3 stage 1 missions and complete them, you have to wait until next week for more stage 1 missions. Organized to get all done as quick as possible. Run #1 : Stage (1) Too Close, Reverse, Into The Fire, do Reallocation (bonus) during interlude, then Signal, Taking back and Hostage. This run nets you 6 sub-achievements. Lies – you still need H4 Deception Play 🙁 😛 – which is a stage 2.
this guide is specifically for just the making the connection achievement. the hero of the citizens of makeb is being removed; and she lists that achievement on the page of achievements being removed. but that one is literally just a check list of what missions you need for itself and it shows you in game what they are and you can do them in any order. They didn’t fix this achievement yet? Regulars Diverted Troops from Gravity Hook Four Docking Ring to the Cartel Mining Mesa. Had to do “Determined that the Perekta Mesa is Seismically Stable” again after patch 2.2.3. Regulars Diverted Troops from Gravity Hook Four Docking Ring to the Cartel Mining Mesa has been removed though. I don’t see any reference to [STAGE 2][HEROIC 4] Deception Play in the list of Republic tasks to do. Yet it’s listed in the Citizens of Makeb requirements. Do we just do that separately? I’m hoping someone can answer that as well. I don’t see it either in my listings. Maybe it opens up in week 3. Certain missions unlock one another. For example, on the imp side, Inciting Incident on Stage 1 missions, unlocks Herioc 4: Weapon Testing in Stage 2. I would just do it according the guide above, going through the process of elimination. You can do it on multiple toons, so it shouldn’t take too long to find the right combination. Yes. It is not needed for Making Connections, only for CItizens of Makeb. After doing the third step (week three) I was able to do the Heroic Deception play on Stage two. So afterwards you should complete the interlude and then be able to pick up the quest in stage two. Hope it helps! I have the quest [ STAGE 1 ] reverse engineering done , but after [ Stage 2 ] signal intelligence was not still available . What else should I do then? do I absolutely have to do door to door? having troubles with it. speeder bikes at landing pad dissapeer when I slice them.